Bonnie Scotland can be very proud of its 30,000-some lochs and lochans. Firstly, they are a dream to be around, especially if you’re a budding naturist. 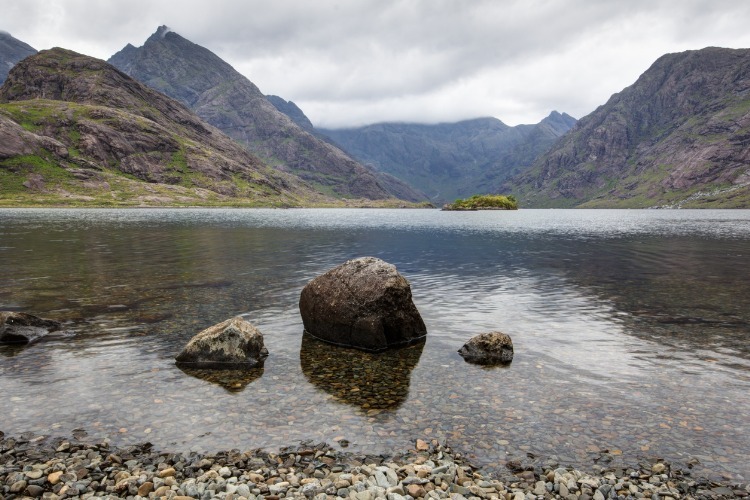 But there’s no ignoring that the Scottish lochs are rich in history and tell a tale of Gaelic myths and legends – which alone makes for a magical trip through their landscapes. To put it lightly, the definition of a loch is… a tad complicated. Lochs can be lakes but they can also be fjords (a narrow inlet with steep sides), so some are closed freshwater lochs, while others are open to the sea and subject to tides. To showcase these beauties for all their glory, we’ve mapped out what we think are some of the best lochs in Scotland. The serenely stunning Loch Corusick is located on the Isle of Skye. Over the years the loch and its panoramic views of the Black Cuillin peaks have been the subject of great art and is the scene of a celebrated JMW Turner painting (suitably named Lock Corusick and found at the National Gallery of Scotland) as well as the sublime poem Loch Corriskin by Sir Walter Scott. Following Scott’s haunting description of the loch, it became a well-visited site of natural beauty. In spite of this, there is only one building in the area – the Loch Corusik Memorial Hut – which was built in memory of two young climbers who lost their lives ascending Ben Nevis. The hut was constructed in the late 50’s by local builder Lachlan Mackinnon whose son Seumas spent much of his childhood with his father on the loch. To this day Seumas runs a tourist boat company sailing from Elgol to Loch Coruisk, and it is a lovely trip to take if you’ve got the time. Loch Shiel is the site of the most famous view pictured of the Scottish lochs. Looking southward over the loch from the Glenfinnan monument you have a glistening view of the loch where it fills the deep cleft ancient glaciers once carved into the surrounding hills. This is also where the Jacobite Express steam train crosses the Glenfinnan viaduct, a scene which is probably familiar to you from the Harry Potter films (Hogwarts Express, anyone?). 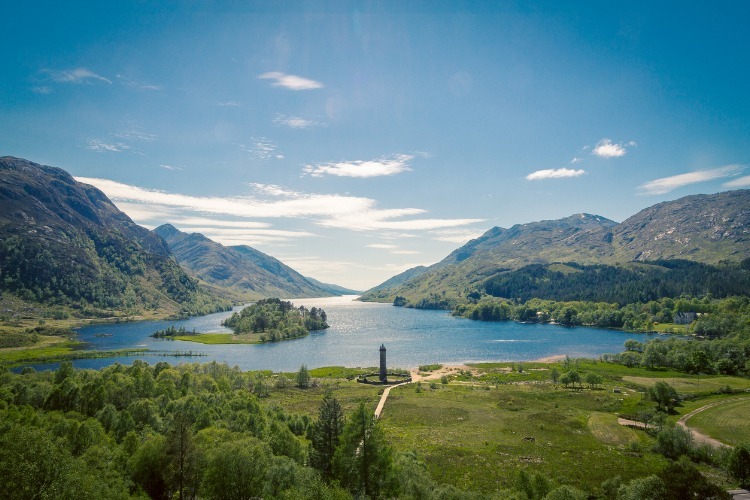 The grand Glenfinnan Monument stands tall and proud on the shores of Loch Shiel. It marks the exact spot where Bonnie Prince Charlie raised his standard and begun the second Jacobite uprising less than a year before the Battle of Culloden. Beyond these iconic sites, Loch Shiel is also home to spectacular wildlife and the best way to spot eagles, otters and black-throated divers is to take a slow cruise over the still waters. The high tide at Loch Etive causes the worlds second largest tidal race – known as the Falls of Lora – to stand guard over its seaward facing mouth. It is a grand spectacle, perfectly complemented by the wild mountains towering iconically over the water. At the north end of the loch, you can take in views all the way up Glen Etive to the twin peaks of Buachaille Etive. Turning towards its waters you’re likely to spot seals sunbathing on the rocks. Many other species of wildlife also gather here, but as they keep more to themselves you’ll need a bit of extra luck to spot them. The best way to catch a glimpse is probably by walking the ancient highland route that runs the length of Loch Etive. Most of it is inaccessible by car, so the very best views can only be reached on foot. However, this makes the experience that much more special. The very largest loch in Britain goes under the name of Loch Lomond. It is quite the hotspot for tourism found within the spectacular Trossachs National park. 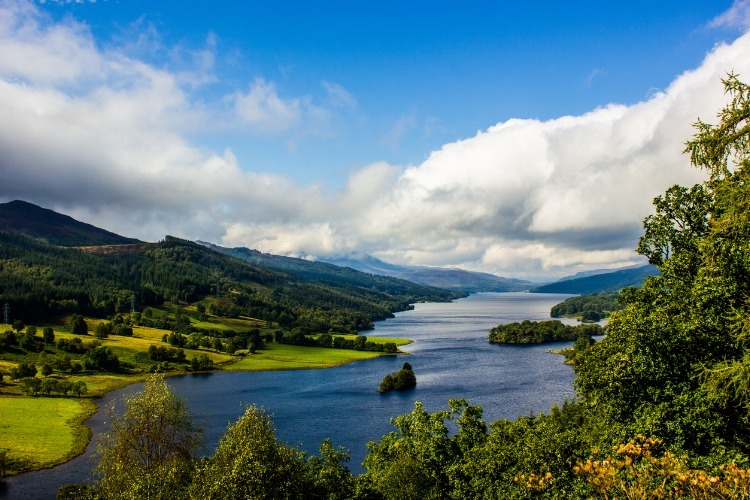 The Trossachs refer to that wonderfully romantic and well-travelled area east of Ben Lomond which is lush with lochs, hills, forests and quaint villages. It’s where some of the most beautiful places in Scotland, like Loch Lomond, can be found. As it is a favourite region for both locals and visitors to relax and connect with nature, the loch can get rather busy. If you’d prefer to get away from the crowds, head to Firkins point. From here, the views are fantastic but busses aren’t allowed, so it’s usually a bit quieter. At Firkins, you can also access a still walking path along one of the loch’s heads. A livelier but equally grand lookout over Loch Lomond is found atop Balloch Castle on the loch’s south-east tip. Stretching out comfortably in the Argyll and Bute landscapes of Scotland is the longest of the freshwater lochs, Loch Awe. Its northern waters are surrounded by the thousand metres high mountain summits of Ben Cruachan and Ben Lui, while its south end embraces a fleet of small islands (many of which are guarded by eerie standing stones). The narrowness of the twenty-eight-mile long loch makes its views uniquely breathtaking. Even its widest point isn’t very wide, but there the runs into its sister, the River Awe. 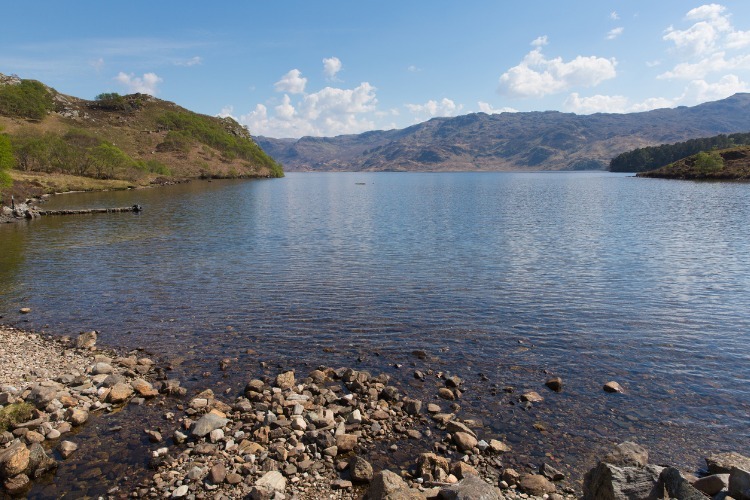 Fishing enthusiasts will know Loch Awe for its renowned trout population. 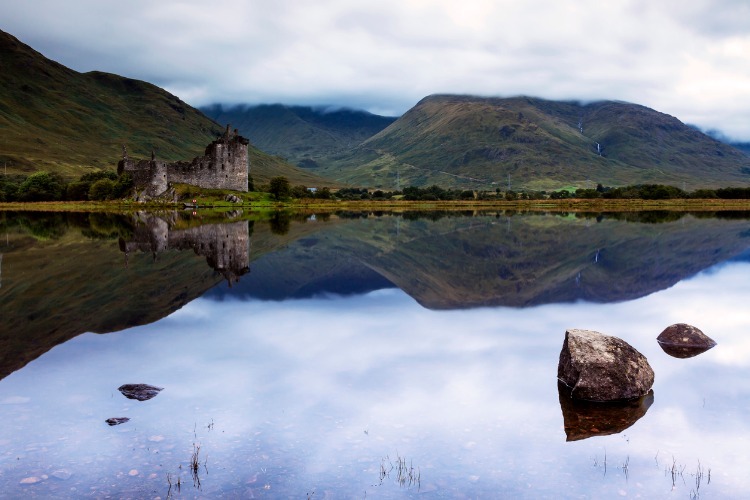 Others may have heard that it is home to the famous Kilchurn Castle ruins. Kilchurn is one of the most photographed castles in all of Scotland, and you can visit its ruins by taking a short boat ride to the north side of the loch. In Perthshire’s ‘Big Tree Country’, where the colours of nature are ever-changing with Scotland’s stubborn seasons, lies Loch Tummel. The long and narrow loch is known to many as the most beautiful place in that part of the country, and the very best view is set high above its eastern edge. Known as Queens View, this is one of the most famous viewpoints in Scotland. After her visit to Loch Tummel in 1866, Queen Victoria claimed the View was named after her. But locals will know that the spot had already borne its name for over five centuries by then. Queens View is much beloved for its panorama over the lake, the peak of Schiehallion and Rannoch Moor, which is an absolutely breathtaking sight. Just west of it, you will also find a set of walking trails with sweet views of the loch and its surrounding countryside. 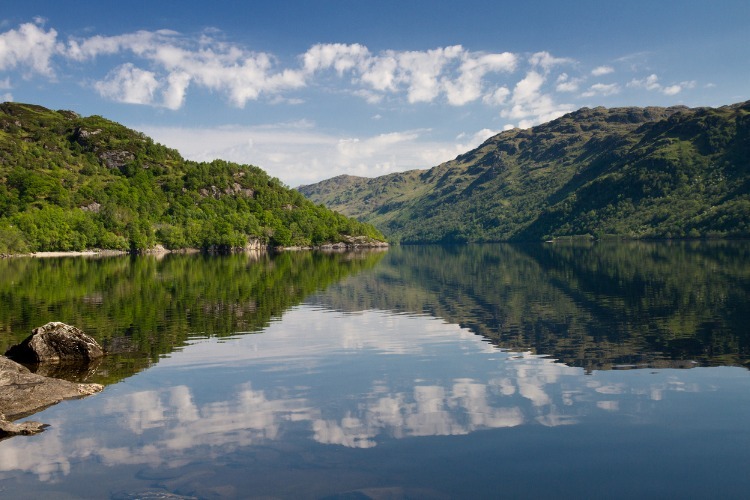 Loch Morar is keeper of the deepest waters found on the British Isles. The glacial cavity, which is over 10 000 years old, is deeper than the height of the Shard building in London. It’s also where Scotland’s second most famous sea monster, Morag, is rumoured to be hiding out along with the much less elusive otter population. Making your way through its wild, mountainous surroundings and down the single lonely footpath winding along the loch’s quiet shores, it’s not difficult to imagine some creature might have been left behind since the ice age. But for those who are unafraid (or especially intrigued), it’s quite enjoyable to swim in the clear waters that never freeze. It’s also worth discovering the wilderness surrounding the loch which is is a real walkers’ paradise providing magnificent views that stretch eastward as far as Ben Nevis. 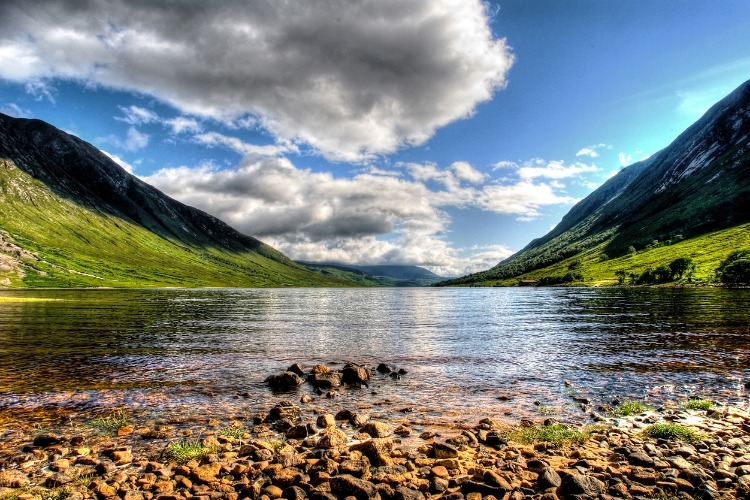 Over a thousand years ago, when the Gaelic kingdom of Dál Riata was ever expanding eastward, the Scots are thought to have named one of their beloved lochs Earn, after their Irish neighbours. 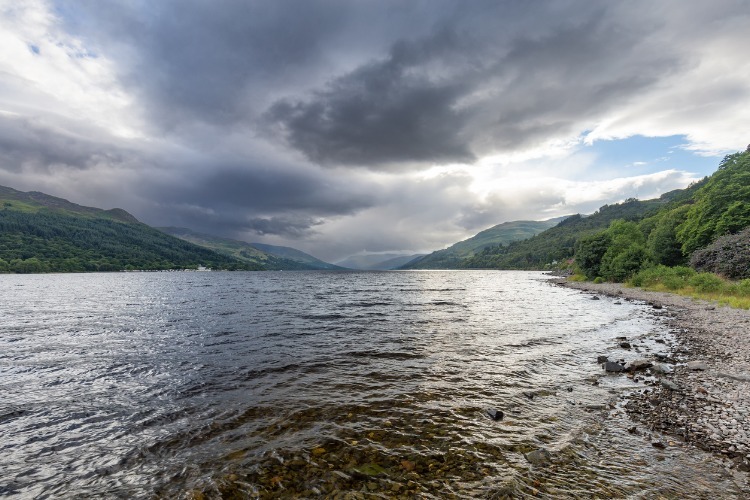 Today, Loch Earn lies firmly in the Scottish Trossachs National park where it is surrounded by much of the country’s most outstanding natural beauty. Loch Earn is a rather special body of water in that it has its owe seiche, or tidal system, governed by nature and strong winds. It is also the source of the River Earn, which joins Scotland’s longest river, the River Tay after a long journey eastward. Within Loch Earn stands one of Scotland’s most beloved sculptures called Still (known to locals as Mirror Man). The sculpture was briefly taken out of the water for a few months during 2017. However, due to popular demand, it has now returned home. In Gaelic, the word Katrine (as innocent as it might sound) means highland robber. 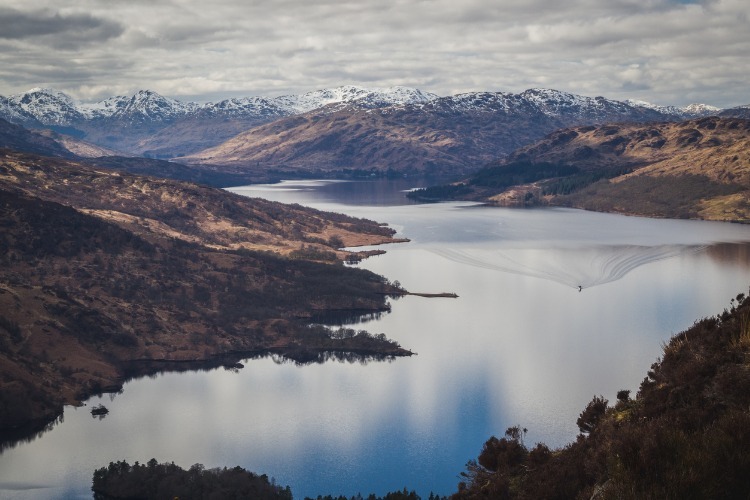 In the 17th century, famous outlaw and folk hero Rob Roy MacGregor was born on the north shore of the secluded body of water that would later be named Loch Katrine in his honour. Over a hundred an fifty years later, Sir Walter Scott would visit the loch and be inspired by its palpable highlander legacy to write his narrative poem Lady of the Lake. To this day, the historic steamships named after Sir Walter ferries passengers from Trossachs pier along the same route her majesty Queen Victoria took on her visit to Loch Katrine in 1869. At times these waters cover with wispy white mists, making the loch appear haunted with the spirits of its rich history. Even so, visitors continue to gather at the loch for a peek at its Trossachs beauty, and to camp out along its shores. Hidden away deep in the untouched parts of the highlands is Loch Maree. The loch is home to five large wooded islands (and over sixty smaller ones), made special by the presence of their own little lakelets. Maree is said to be the most beautiful of the Highland lochs, and it has a special history steeped in myths and legends. 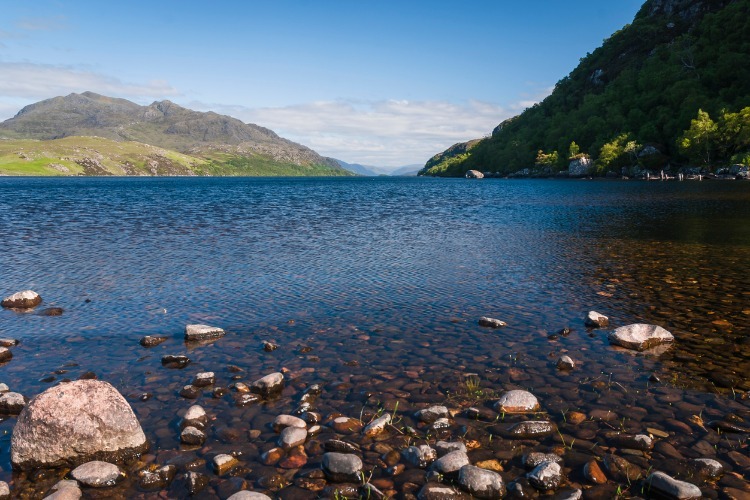 Back in the day, locals believed that the waters of Loch Maree had curative abilities. They said that people submerged in it would be cured of lunacy. To this day, people also tell stories about Loch Maree’s very own eel-like sea monster, muc-sheilch. Perhaps because it really is magical or perhaps because she loved the Scottish Highlands (and rightly so), Queen Victoria visited here in 1877. The waterfall which feeds the loch on its south side is thereafter named Victoria Falls. Hopefully, you’re feeling pretty inspired to take a trip up to Scotland and explore some of these lovely lochs. Why not take the first step on your journey by browsing our luxury cottages in Scotland? Our concierge team can help find the one that’s just right for you. Happy travelling!